Medical Therapeutic Yoga (MTY) is a form of integrated, functional medicine delivered by experienced, licensed medical professionals. 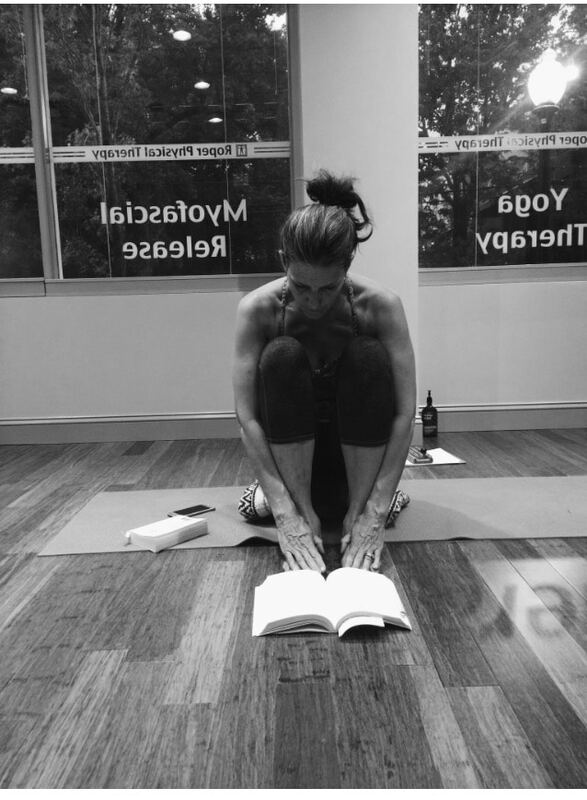 Ginger Garner MPT, ATC, PYT, developed medical therapeutic yoga as a system for health care professionals after years of successful patient care with acute and chronic pain patients who fared better when she used yoga as a primary means for delivering rehabilitation. Our physical therapists are trained and certified in the Professional Yoga Therapy Method under Ginger Garner MPT, ATC, PYT, founder and educator in medical therapeutic yoga, orthopedics, and women’s health. We prescribe yoga according to your specific medical condition. We offer a new model for fitness and rehabilitation that helps you maintain health in a simpler, more holistic way. Roper Physical Therapy offers weekly Medical Therapeutic Yoga (MTY) classes in addition to Private and Semi-Private Yoga Assessments. Classes are taught in our semi-private studio allowing a maximum of 8 people per class. This environment provides the freedom to offer plenty of individualized instruction including hands-on adjustments,myofascial release and an abundance of education in each class. We incorporate the emotional, social, intellectual, physical and spiritual aspects of wellness in our classes and encourage it in everyday living. All classes offered at Roper Physical Therapy are medical -based instructional yoga for all levels taught by a licensed physical therapist. ” I was referred to the medical therapeutic yoga program at Roper PT by another physical therapist I was working with who felt yoga could help to increase my flexibility. Two years later I am a flexible, strong, self aware, appreciative yogi with a growing understanding of my world and my place in it.Medical Therapeutic Yoga at Roper PT has been a game changer for me! It isn’t a room packed full of yoga mats, quickly flowing through poses. This is intentional instruction by extraordinary Physical Therapists with emphasis on proper body mechanics. Yoga as Medicine works best with commitment. Classes are purchased in advance as a monthly series. New students may purchase an Introductory Class for $25.00. Continued participation will require payment for remainder of the series up front. Register for classes by the first of every month. A minimum of 6 students must be registered per class in order to offer the classes at a $22.00 rate. If less than 6 students are registered per class by the first of each month we will give our students the option of semi-private instruction before canceling. Semi-private fees will be determined by the number of students enrolled. Yoga as Medicine works best with a commitment. We are unable to offer class extensions, “roll overs” or refunds unless of very unforeseen circumstances. You have 30 days to use your class series. You may attend any of the three class offerings in order to “make up” a missed class if needed. Private Yoga/Semi Private Yoga: One hour Private and Semi-Private Yoga Sessions are available with a licensed physical therapist. Step 2: Complete the required paperwork and bring it with you on your first visit. Step 3: Payment is required at time of service. MC/V, cash and checks are accepted forms of payment. Please bring a standard yoga mat and a bottle of water. All external props are provided (blocks, straps, blankets). Athletic wear that is semi-form fitting works best when practicing yoga. Welcome to Medical Therapeutic Yoga from Ginger Garner on Vimeo.